Visit Rail Europe to get all information on most popular products to visit Spain and more specially Catalonia. Looking to explore the beauty that is Spain? The AVE is a high-speed train connecting cities in Spain, so that travelers can experience all that the illustrious region has to offer. 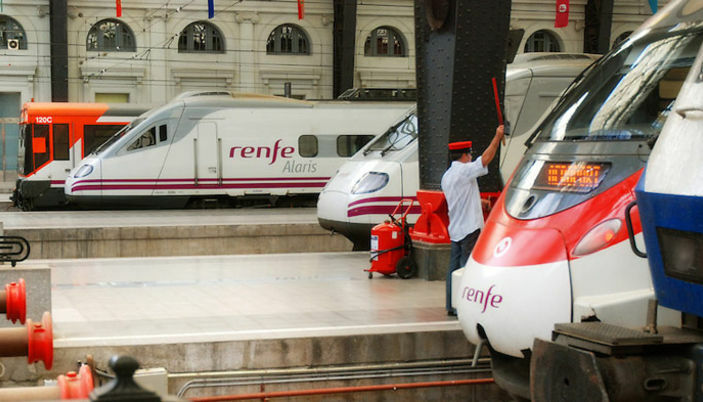 Plan on breathing the fresh air of Madrid, Seville, Malaga and Barcelona —the train’s four major destinations—as you coast from city to city inside one of the window-lined, high-tech cars of the AVE. Known for its speed, reasonable fares and flexible schedules, the AVE remains the ideal form of transportation for savvy travelers looking for an unparalleled Spanish experience. Take advantage of the rail and design a trip that takes you from the breathtaking monuments of Madrid to the art and design of Barcelona and the fine cuisine in Seville. Ticket control and passport checks will occur at the station before boarding the AVE train. Gate closes 2 minutes prior to the trains’ departure time. Spain’s high-speed AVE train comfortably transports you from the breathtaking monuments of Madrid to the art and design of Barcelona and the fine cuisine in Seville. It all starts with just a little inquisition below. See the real Spain, while ensuring that you effortlessly get around without the burdens of inexperience, traffic or uncertainty. Of course, if you’d like some uncertainty, there’s always the bullring. Choice of 3, 4, 5, 6, 7, 8, 9 or 10 days within a 2 month period. First-class and second-class are available. First-class seats often recline, have more storage space, and are typically in quieter cars.